Coming to home video on August 8 from Strand Releasing is TRANSFIGURATION, a vampire film that has split critics into love and hate factions. African American teen Milo effectively lives alone. Left in the care of his older brother Milo wanders the streets and deals with the life he is forced to lead. Fascinated by vampire lore Milo wants to become one himself so every now and again he wanders into Manhattan to feed in the hope of triggering a transformation. Things become complicated when Milo meets Sophie a white girl who moves into his building. 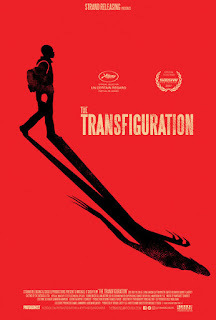 Incredibly melancholy and ultimately down right sad, THE TRANSFIGURATION is less horror film than coming of age tale. As with the best horror films there is all sorts allegorical notions running through the film not the lest of which are notions of what it means to grow up and thoughts on what it means to connect with humanity. I was moved. A beautiful marriage of sound and image this is a film where everything works together to make s really feel what Milo is experiencing. Sounds, music and camera movement set the tone to an amazing degree. After I had gone through the film the first time I went back and watched it a second just to see how several sequences were put together. Michael O'Shea has done a masterful job and I was shocked to find out it was his first feature. As good as the film is, the film is a little too the wrong sort of echoey of past films, particularly LET THE RIGHT ONE IN. Perhaps if Chloe Levine had looked a bit less like Lina Leandersson I would have let it slide.